Purchase includes an Oshkosh Striker Simulator virtual reality training system. OSHKOSH, WIS. (January 5, 2017) – Oshkosh Airport Products, LLC, an Oshkosh Corporation (NYSE: OSK) company, has received an order for 24 Oshkosh® Striker® Aircraft Rescue and Fire Fighting (ARFF) vehicles from the Port Authority of New York and New Jersey (PANYNJ). The purchase includes 14 Oshkosh Striker 6 X 6 vehicles, seven of which are equipped with a 65-foot Snozzle® High Reach Extendable Turret (HRET), and ten Striker 4 X 4 apparatus. The PANYNJ also purchased a Striker Simulator virtual reality training system. The vehicles will be placed into service at John F. Kennedy International Airport, Newark International Airport, LaGuardia International Airport, and Teterboro Airport. The order represents the third generation of Oshkosh ARFF vehicles to serve with PANYNJ. The new vehicles will replace a fleet of first-generation Oshkosh Striker apparatus that were placed into service between 2002 and 2005, and those vehicles supplanted a fleet of Oshkosh T-Series™ ARFF vehicles that date to the 1990s. The seven Snozzle-equipped vehicles will be the first 6 X 6 units furnished with Oshkosh’s longer 65-foot device that keeps firefighters further away from danger. The innovative Snozzle HRET features a hardened carbide steel tip, a perforated nozzle and a forward-looking infrared camera. The piercing steel tip now offers an updated hydraulic rotary actuator, an increased range of motion (up to 280º), longer piercing depth and a decreased overall width for better visibility. Inside the cab, a new control module feature simplifies operator controls and provides smoother operation. The vehicles’ firefighting systems include tri-agent capabilities – featuring Halotron, dry chemical, foam and water. All of the Strikers are equipped with a Scania Tier IV Final low emission engine, Oshkosh TAK-4® independent suspension, an Allison electronic transmission, and engine power pack components that are readily accessed through walk-in doors on either side of the engine compartment. The Striker Simulator system, purchased in conjunction with the 24 Oshkosh Striker vehicles, depicts a nearly endless array of training scenarios for aircraft rescue and fire fighting organizations. The virtual reality training system incorporates video footage and illustrated environments of Striker vehicles in action – with views from both inside and outside of the cab. The system portrays different environmental and weather conditions such as rain, snow, fog, night, and bright daylight. It can accurately depict the delivery of dry chemical, foam, water, and Halotron. 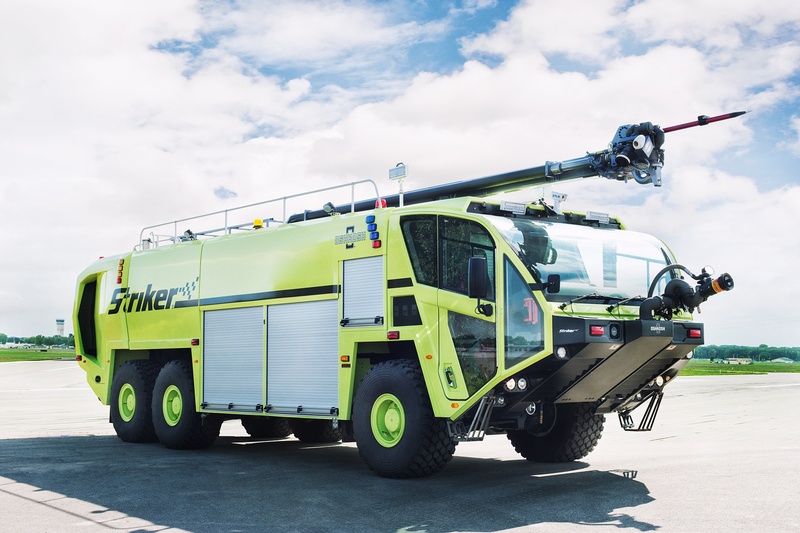 Photo caption: Oshkosh Airport Products has received an order for 24 Oshkosh® Striker® Aircraft Rescue and Fire Fighting (ARFF) vehicles from the Port Authority of New York and New Jersey (PANYNJ). The purchase includes 14 Oshkosh Striker 6 X 6 vehicles, seven of which are equipped with the Snozzle® High Reach Extendable Turret (HRET), and ten Striker 4 X 4 apparatus. The Oshkosh Striker 6 X 6 shown here is similar to ones ordered by the PANYNJ.